Give your leisure look couture flair with the Sam Edelman Levine sneaker. Satin upper with frayed detailing. Slip-on design with rear pull tab. Bead and rhinestone eye detailing at vamp. Round-toe silhouette. Man-made lining and insole. Lightly cushioned footbed. Man-made outsole. Imported. Measurements: Weight: 13 oz Product measurements were taken using size 9, width M. Please note that measurements may vary by size. Weight of footwear is based on a single item, not a pair. 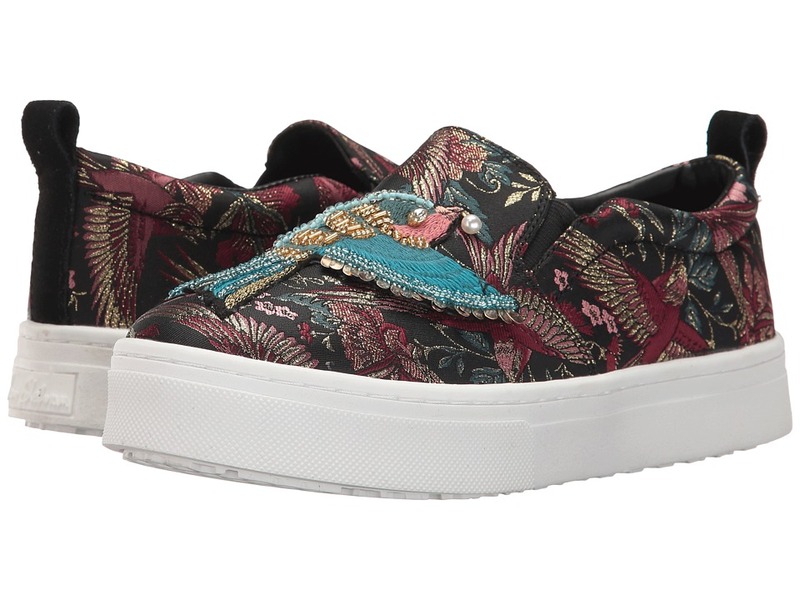 Give your leisure look couture flair with the Sam Edelman Levine sneaker. Satin upper with frayed detailing. Slip-on design with rear pull tab. Textile lining. Lightly cushioned insole. Lightly padded footbed. Synthetic outsole. Imported. Measurements: Weight: 12 oz Product measurements were taken using size 8, width M. Please note that measurements may vary by size. Weight of footwear is based on a single item, not a pair. Love your lines with the luxurious Sam Edelman Lewellyn. Suede or leather upper depending on colorway. Slip-in entry. Pointed toe. Man-made lining. Lightly-padded insole. Stacked heel. Man-made outsole. Imported. Measurements: Heel Height: 1 in Weight: 8 oz Product measurements were taken using size 9, width M. Please note that measurements may vary by size. Weight of footwear is based on a single item, not a pair. 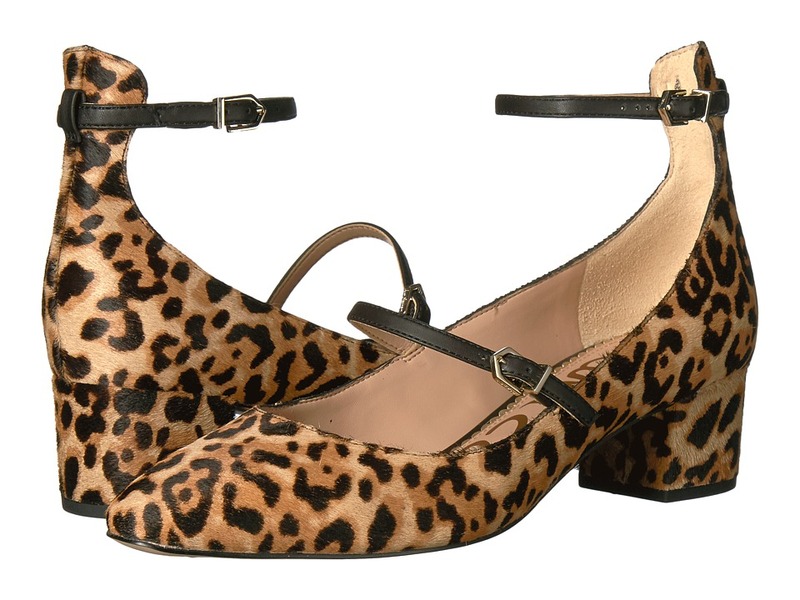 Revive your retro look with the sharp lines of the Ludlow from Sam Edelman! Available in a variety of uppers. 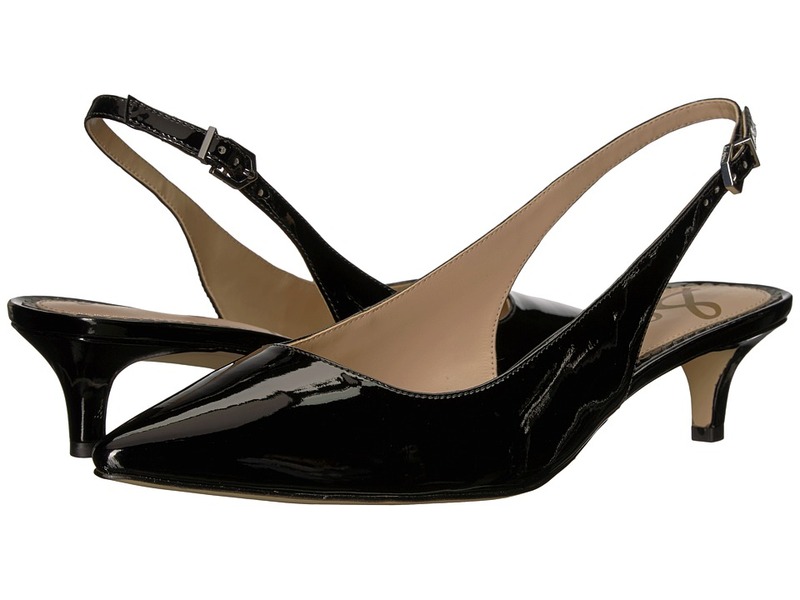 Slingback with adjustable buckle closure. Point-toe silhouette. Man-made lining and insole. Lightly cushioned footbed. Wrapped kitten heel. Man-made outsole. Imported. Measurements: Heel Height: 2 1 4 in Weight: 7 oz Product measurements were taken using size 8.5, width W. Please note that measurements may vary by size. Weight of footwear is based on a single item, not a pair. Reach for romance. 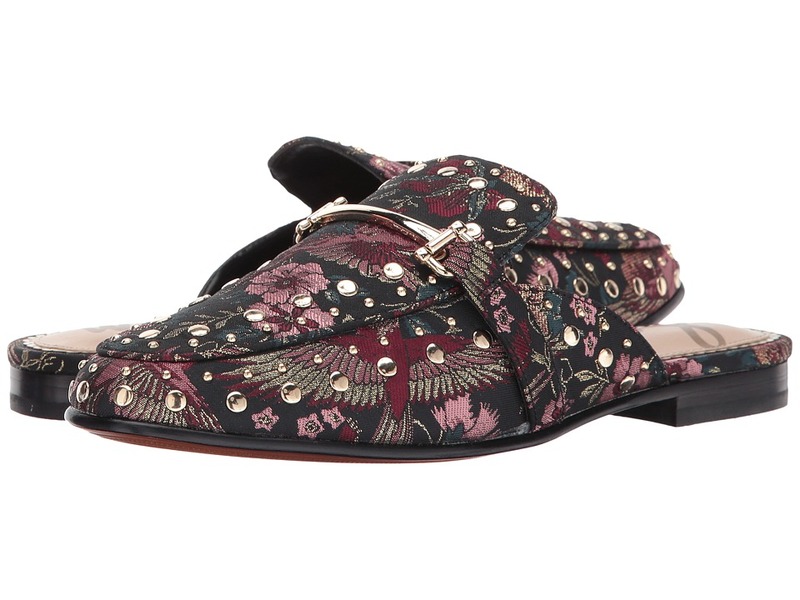 The Lulie from Sam Edelman gives you a sweet and stylish edge over the rest! Available in a variety of uppers. Dual adjustable buckle strap closures. Almond-toe silhouette. Man-made lining. Lightly cushioned footbed. Wrapped, block heel. Man-made outsole. Imported. Measurements: Heel Height: 1 1 2 in Weight: 9 oz Product measurements were taken using size 7.5, width W. Please note that measurements may vary by size. Weight of footwear is based on a single item, not a pair. Maximize on memorable with the alluring Marilyn mule from Sam Edelman. Leather or textile upper depending on colorway. Slip-on design. Round-toe silhouette. 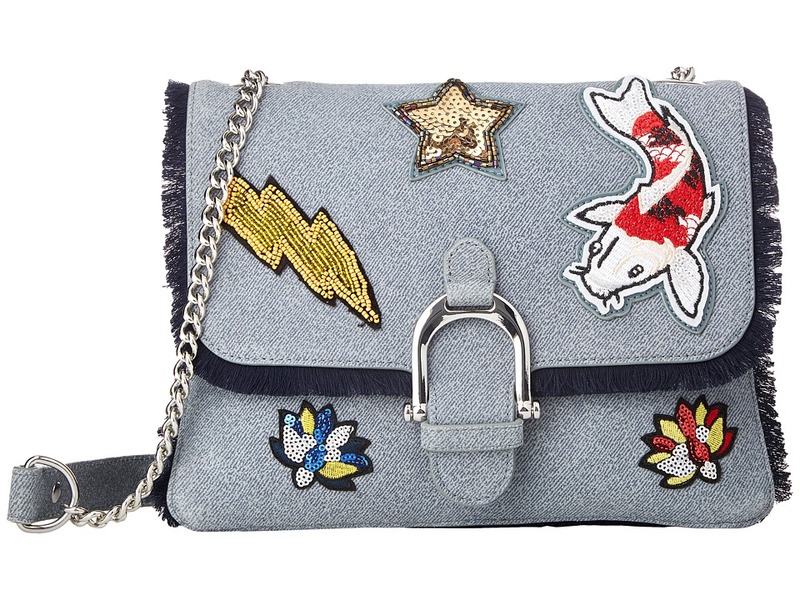 Allover polished studs and horsebit detailing. Man-made lining. Lightly cushioned footbed. Low, stacked heel. Man-made outsole. Imported. Measurements: Heel Height: 3 4 in Weight: 8 oz Product measurements were taken using size 8, width M. Please note that measurements may vary by size. Weight of footwear is based on a single item, not a pair. Twinkle from the toes up in the stellar Sam Edelman Rexley flat. Textile upper. Halo strap with adjustable buckle closure. Point-toe silhouette. Shoes feature separate beaded star embellishment on left and moon embellishment on right. Nappa leather lining. Lightly-padded insole. Micro heel. Man-made outsole. Imported. Measurements: Heel Height: 1 4 in Weight: 7 oz Product measurements were taken using size 8, width M. Please note that measurements may vary by size. Weight of footwear is based on a single item, not a pair. 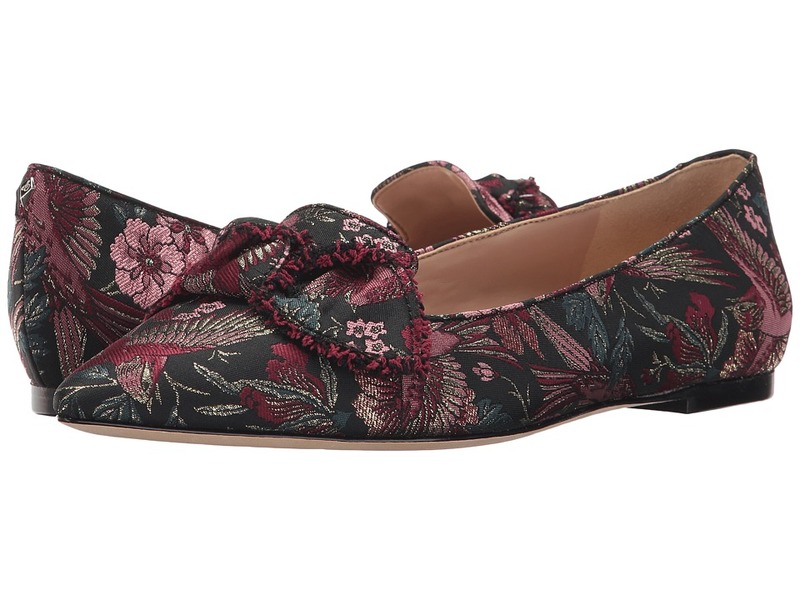 Let fashion point you in the right direction this season with the truly transitional Rochester flat from Sam Edelman. Available in a variety of uppers. Slip-on design. Point-toe silhouette. Knot-tie detail at vamp with fringe accent. Man-made lining. Lightly cushioned footbed. Low heel. Leather outsole. Imported. Measurements: Heel Height: 1 4 in Weight: 7 oz Product measurements were taken using size 8, width M. Please note that measurements may vary by size. Weight of footwear is based on a single item, not a pair. 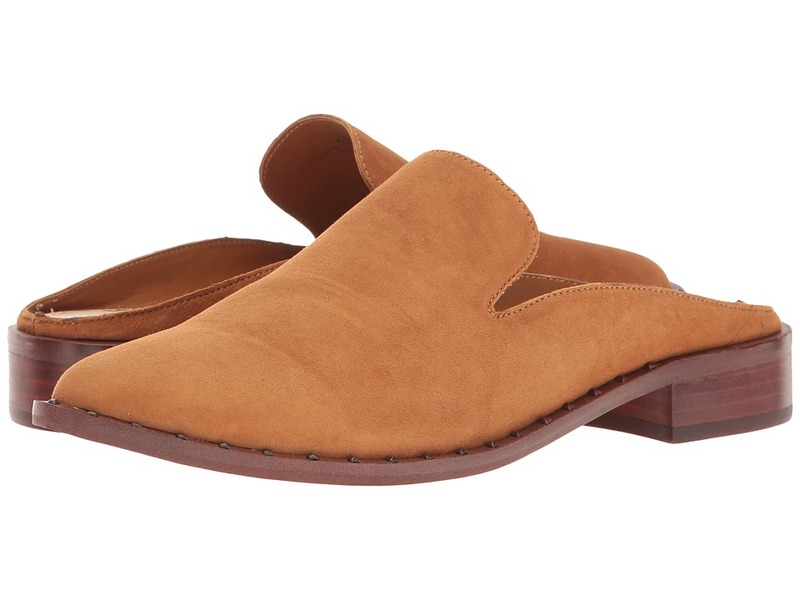 Keep your look chic and to-the-point with the Rodney flat from Sam Edelman. Available in a variety of uppers. Slip-on design. Point-toe, d~Orsay silhouette. Man-made lining. Lightly cushioned footbed. Micro-heel. Man-made outsole. Imported. Measurements: Heel Height: 1 2 in Weight: 7 oz Product measurements were taken using size 7.5, width W. Please note that measurements may vary by size. Weight of footwear is based on a single item, not a pair. 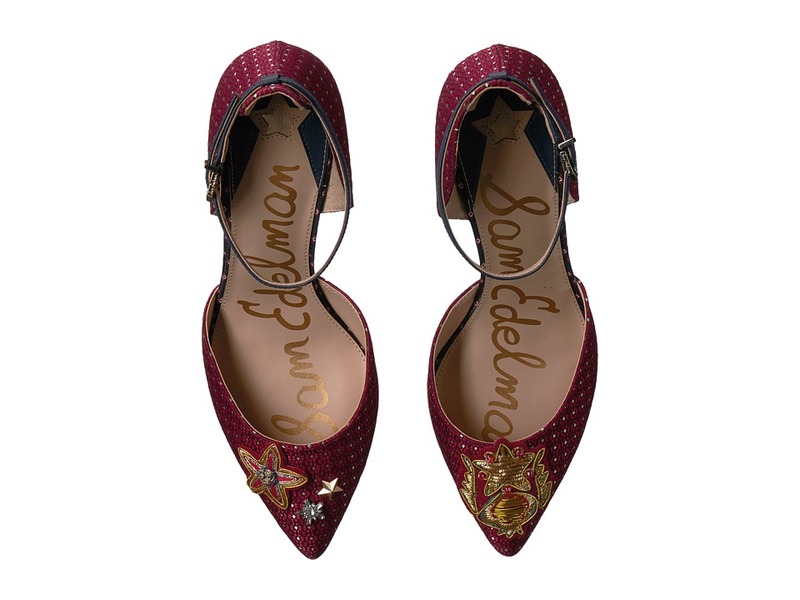 Stop traffic in the always eye-catching Stillson pump from Sam Edelman. Available in a variety of uppers. Slip-on design. Softly squared-toe silhouette. Man-made lining. Lightly cushioned footbed. Wrapped block heel. Man-made outsole. Imported. Measurements: Heel Height: 3 1 2 in Weight: 11 oz Product measurements were taken using size 8.5, width M. Please note that measurements may vary by size. Weight of footwear is based on a single item, not a pair. Seduce your style with the chic Sam Edelman Susie heels. Available in a variety of uppers Buckle closure at ankle. Man-made lining. Lightly cushioned insole. Chunky blocked heel. Man-made outsole. Imported. Measurements: Heel Height: 2 1 2 in Weight: 9 oz Product measurements were taken using size 8.5, width M. Please note that measurements may vary by size. Weight of footwear is based on a single item, not a pair. Keeping an eye on style? 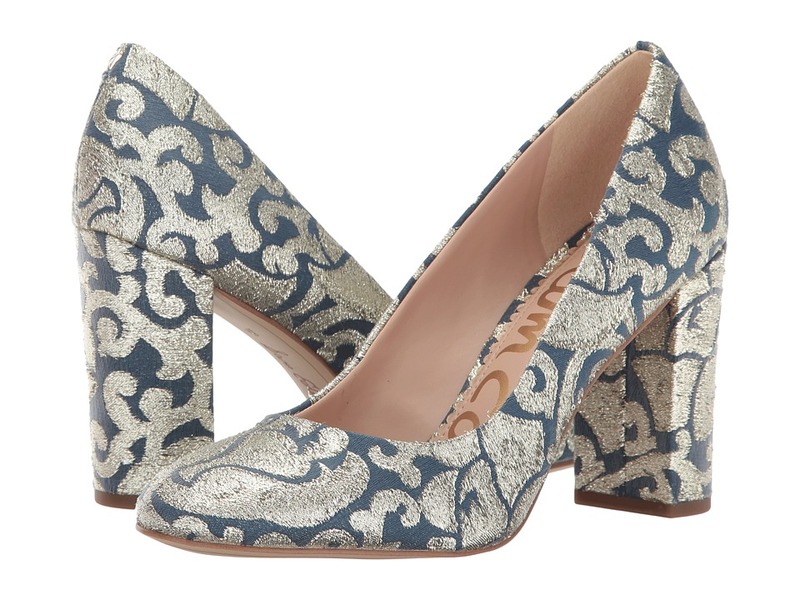 Let the Sam Edelman Tabby 2 pump be the next star in your wardrobe. 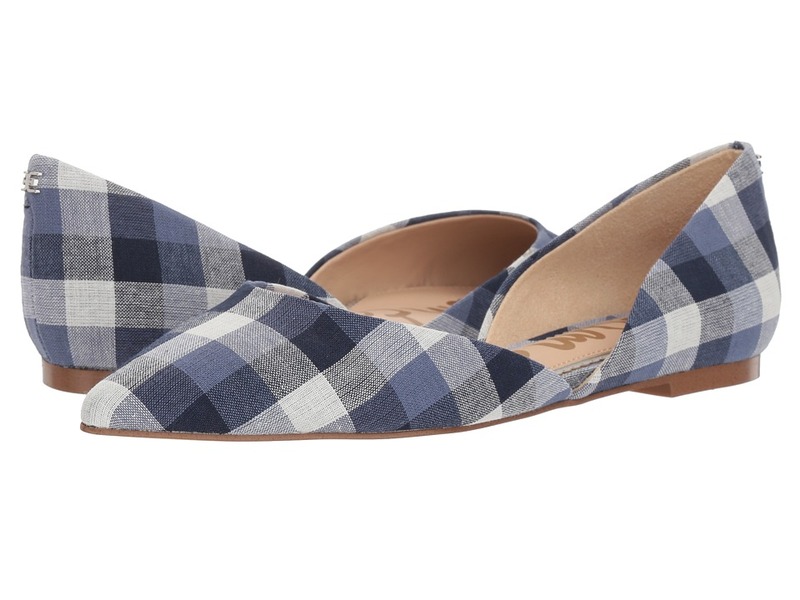 Patterned fabric upper. Halo strap with adjustable buckle closure. Point-toe, d~Orsay silhouette. Mismatched star and sigil patches at vamp. Man-made lining and insole. Lightly padded footbed. Wrapped stem heel. Man-made outsole. Imported. Measurements: Heel Height: 3 in Weight: 8 oz Product measurements were taken using size 9, width M. Please note that measurements may vary by size. Weight of footwear is based on a single item, not a pair. What happens after the clock strikes twelve? Capture midnight in silky style with the Sam Edelman Tabby 3 pump. Premium velvet upper. Halo strap with adjustable buckle closure. Point-toe, d~Orsay silhouette. Mismatched rhinestone moon and shooting star embellishment at vamp. Nappa leather lining. Lightly cushioned footbed. Wrapped stem heel. Man-made sole. Imported. Measurements: Heel Height: 3 in Weight: 8 oz Product measurements were taken using size 8.5, width M. Please note that measurements may vary by size. Weight of footwear is based on a single item, not a pair. Dominate the urban landscape in these boldly feminine Yeager shooties. Supple suede upper with tonal stitching. Back zipper closure with elasticized ghillie lacing. Open-toe, caged silhouette. Synthetic lining and insole. Lightly padded footbed. Wrapped block heel. Man-made sole. Imported. Measurements: Heel Height: 3 2 5 in Weight: 11 oz Product measurements were taken using size 7.5, width W. Please note that measurements may vary by size. Weight of footwear is based on a single item, not a pair. 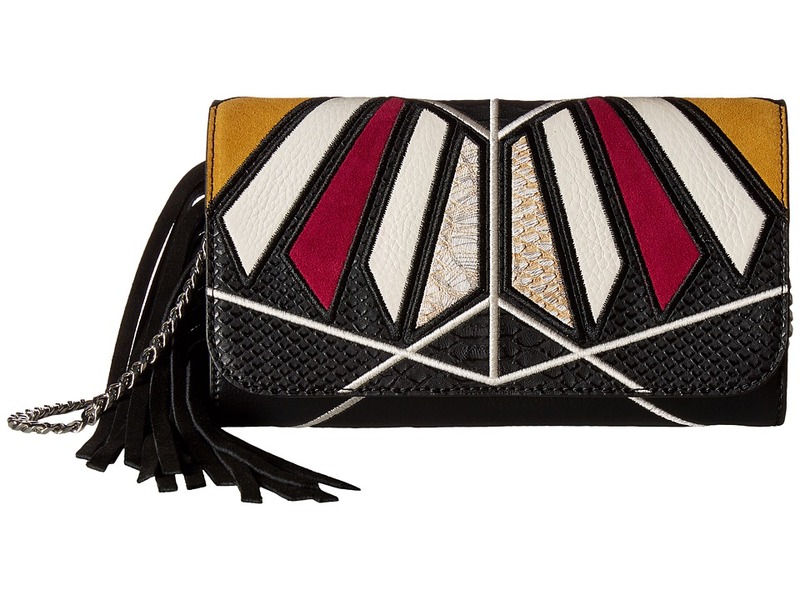 Add some feathered flair to your favorite outfits with the Leila from Sam Edelman. 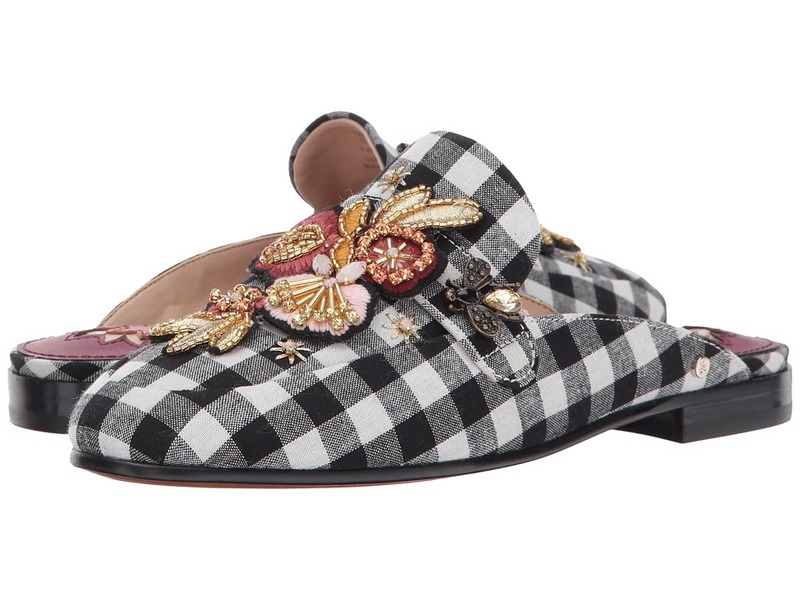 Patterned textile upper. Slip-on design with rear pull tab. Round-toe silhouette. Satin-stitch embroidered bluebird at vamp. Man-made lining. Lightly cushioned footbed. Man-made outsole. Imported. Measurements: Weight: 12 oz Product measurements were taken using size 7.5, width M. Please note that measurements may vary by size. Weight of footwear is based on a single item, not a pair.